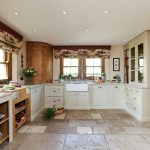 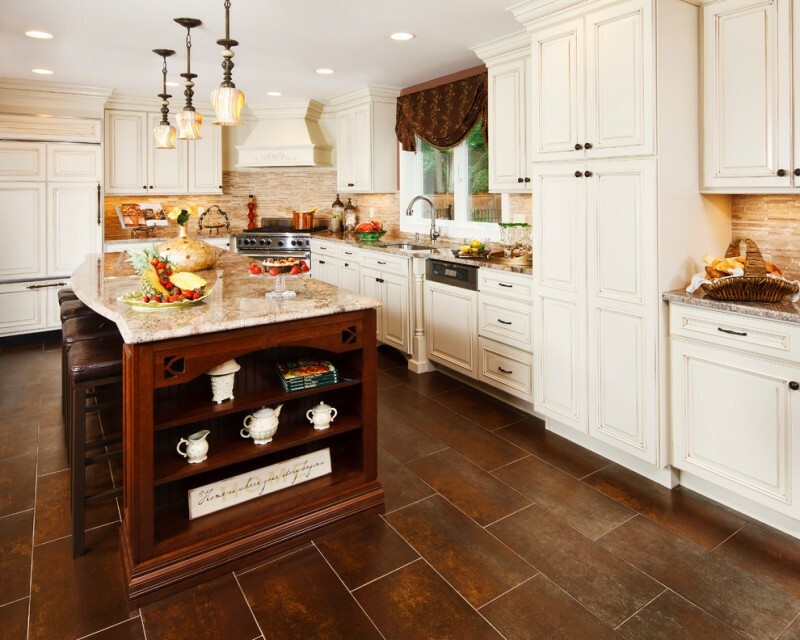 The floor is absolutely an important part of a kitchen as it plays an important role in determining whether the room will be a comfortable place to spend time at or not. 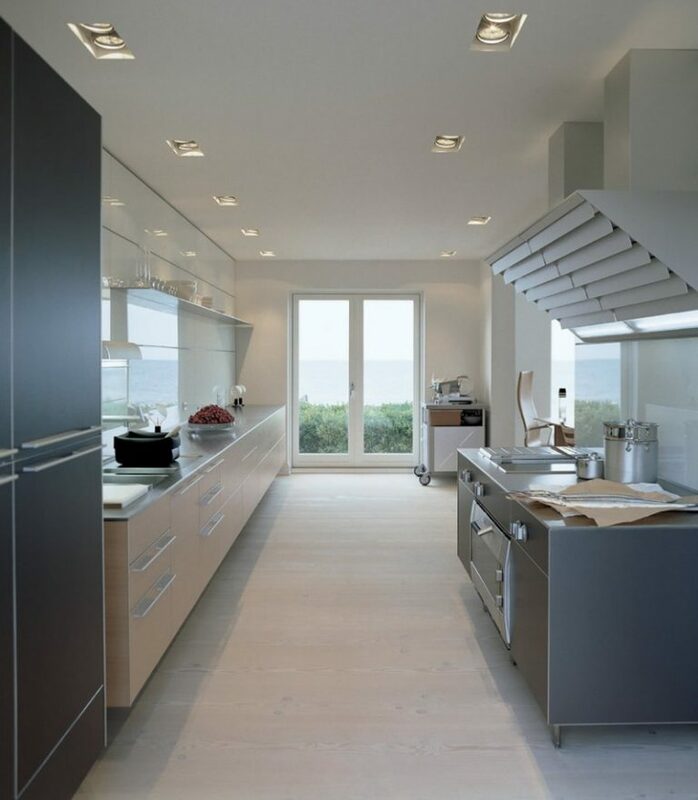 Also, it’s also something that plays an essential role in improving the overall looks of the room. 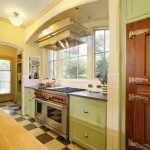 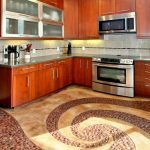 If you consider your kitchen floor important and you’re planning on installing kitchen flooring in the near future, you should take a peek at these floors hoping to find some ingenious flooring ideas you can utilize in your kitchen. 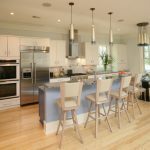 A hardwood floor will instantly look elegant and if hardwood flooring is what you’d love to install in your kitchen, get inspired by this hardwood floor that’s accompanied by beige cabinets, tall chairs, a painting decorating the wall, and more. Normally, people would build a wall with exposed bricks but the builders who built this kitchen sure were among the few people who wouldn’t. Instead, they built a floor with exposed bricks and the result is this amazing floor. 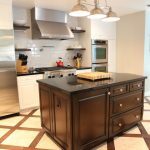 Simple patterns like these are great options for you if you want to let your kitchen furniture to still stand out when standing on top of your kitchen floor. 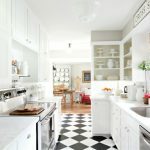 The stainless steel appliances and the furniture pieces used in this kitchen do a great job in collaborating with the classic floor tiles to give the room a classic look. 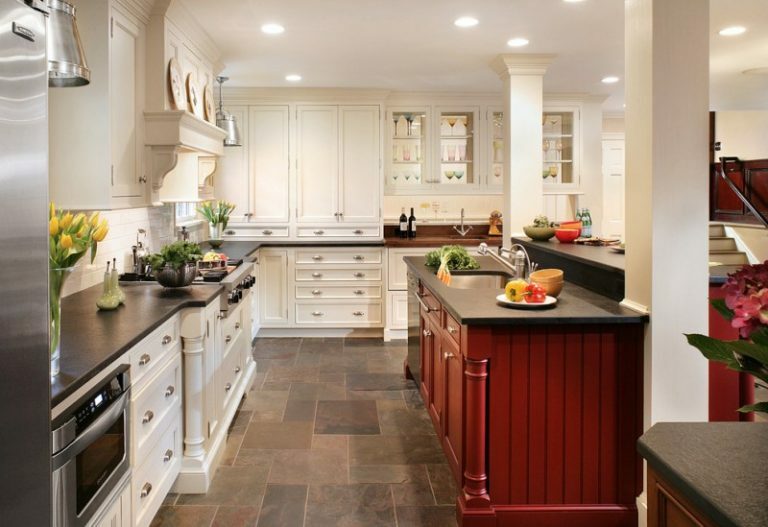 Combined with a white wall and a white ceiling, this dark-colored floor sure creates a contrast that proves to be useful in giving a bold and elegant look to the kitchen, which houses various different appliances. 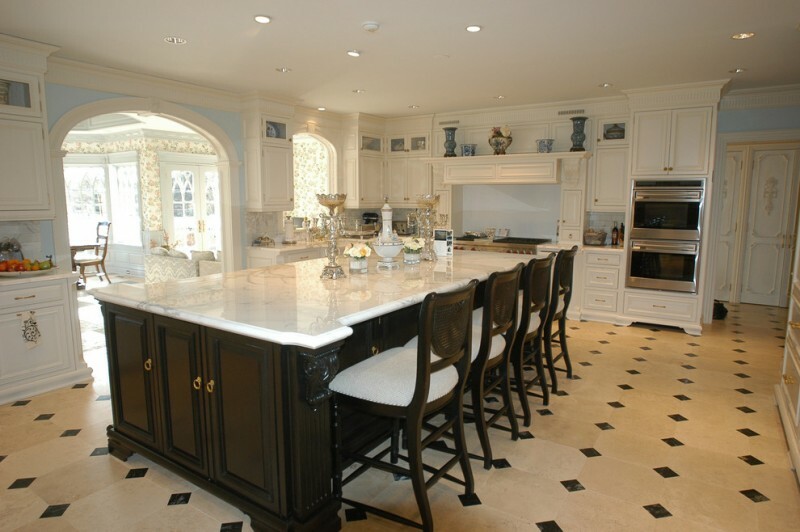 Yes, that’s not a big countertop but actually a floor. 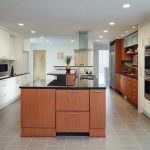 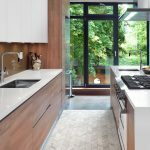 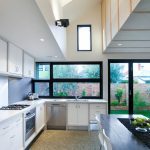 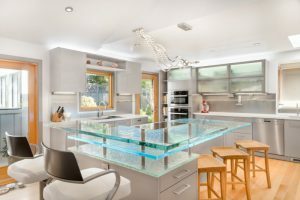 Looking like a countertop, this floor gives an interesting look to the kitchen, which already has a modernly stunning look in the first place with its transparent doors and windows, modern dining chairs, patterns on the ceiling, and more. 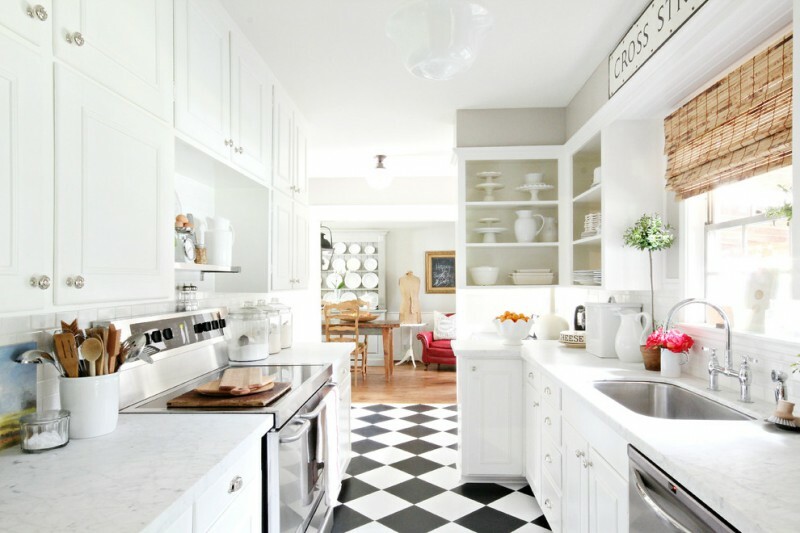 Can you take a peek at that checkered floor? 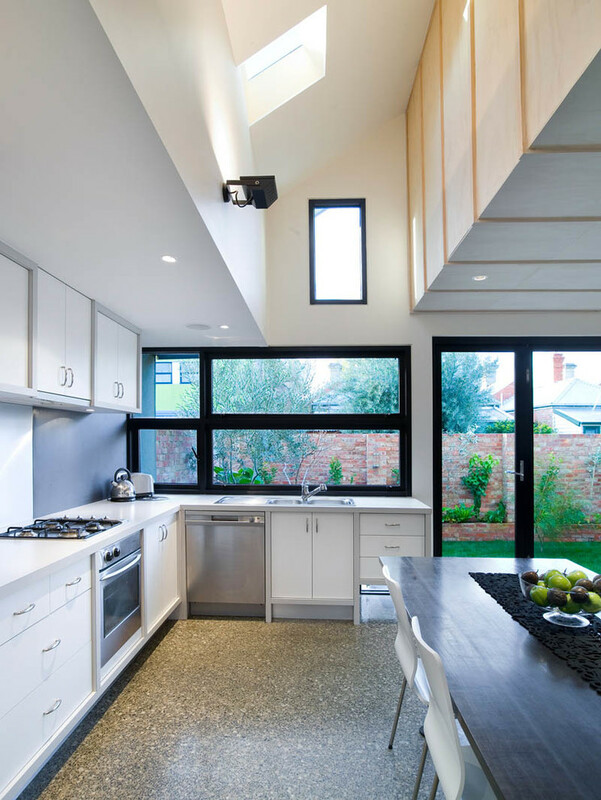 That floor sure adds a nice look to the room, which has big windows that let a lot of brightness in, modern appliances, transparent door, a cute ceiling lamp, and many other awesome things. 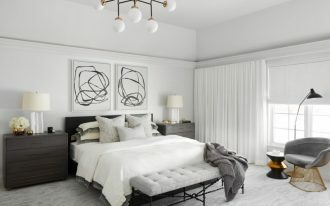 Look at those unique-looking modern hanging lamps. 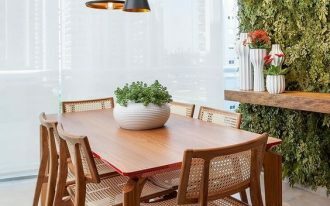 And those tall dining chairs. 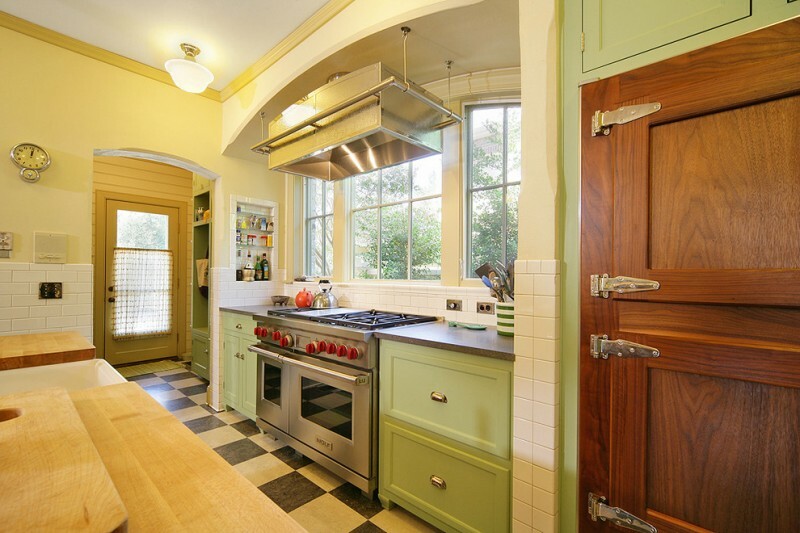 And those modern appliances accompanied by beautiful flowers. 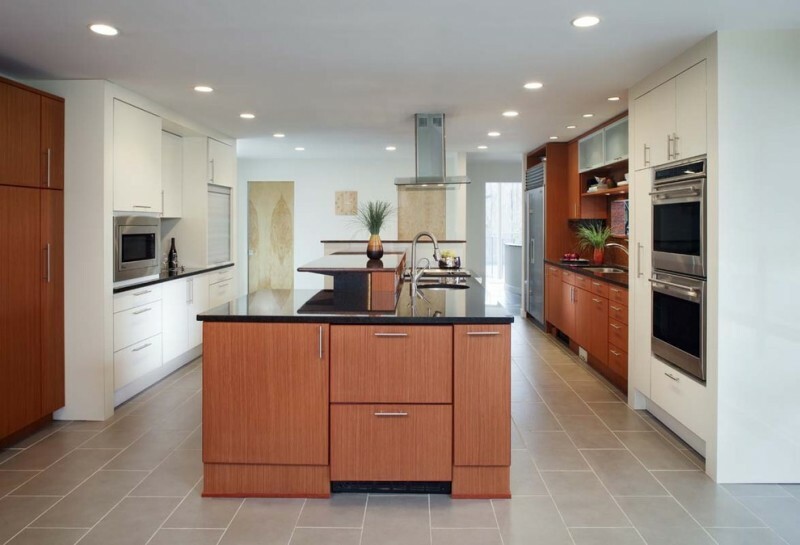 And that bamboo flooring. 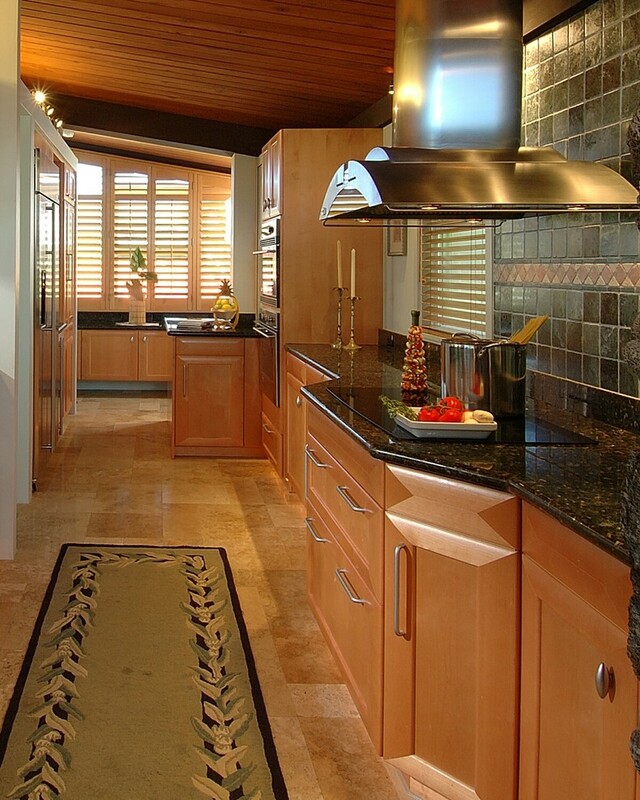 If you’re considering installing bamboo flooring, choose Moso bamboo since it’s very durable. 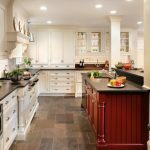 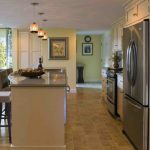 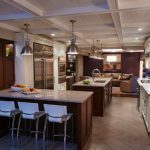 Let dark brown do the work when it comes to inserting the right floor color into a kitchen with a classic look that’s dominated by white. 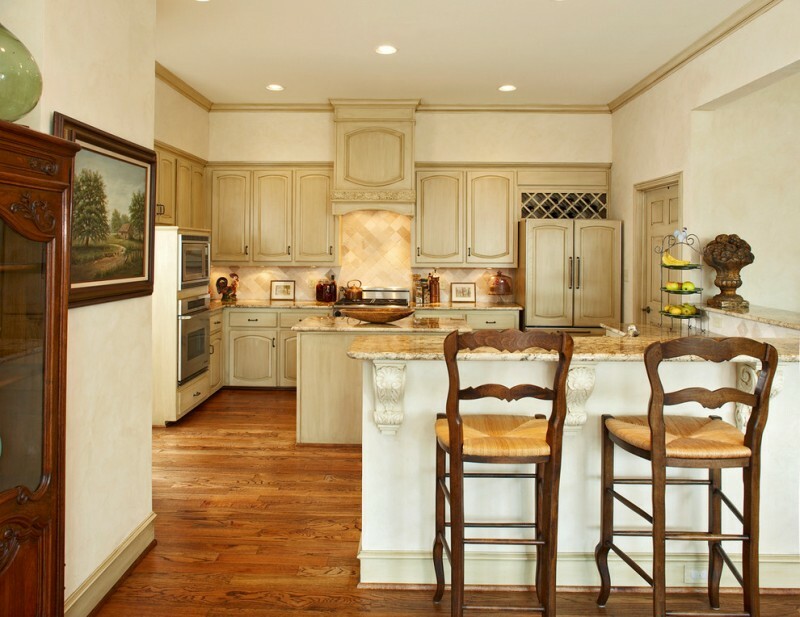 Dark brown will make quick and effective work just like how it’s depicted below. 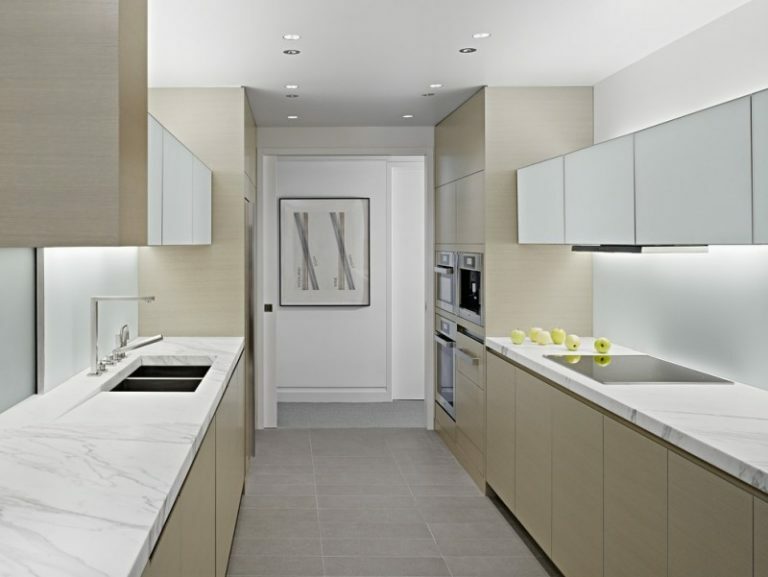 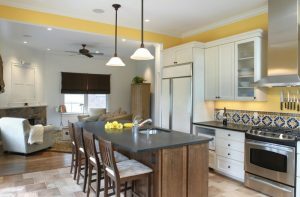 A floor in a light color like, for example, grey can be combined with a contemporary painting, modern storage items, a beautiful countertop, and other things in light color to form a kitchen with a relaxing atmosphere like the one below. 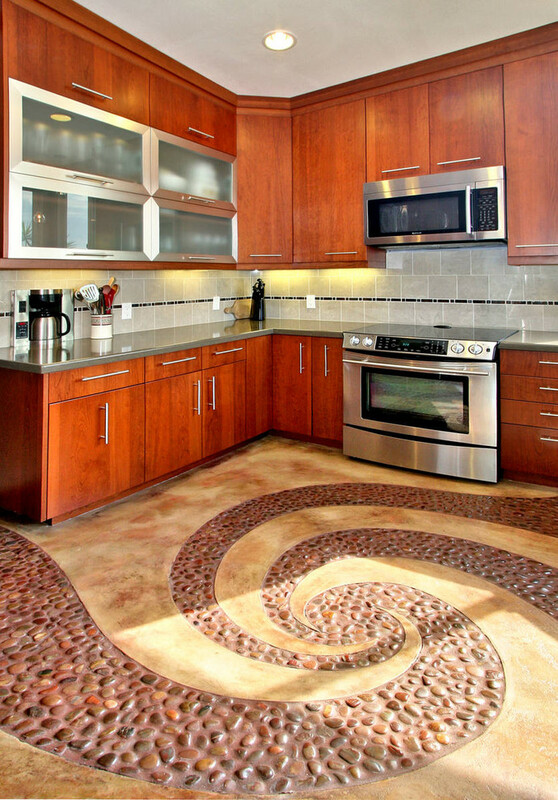 It’s like having a whirlpool inside your kitchen to have a floor like this. 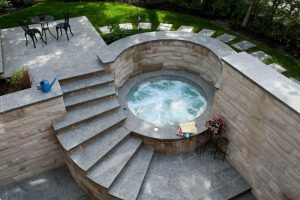 This whirlpool pool is accompanied by things that get along well with it like wooden wall cabinets and numerous other things the kitchen houses. 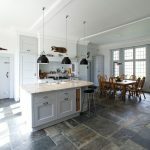 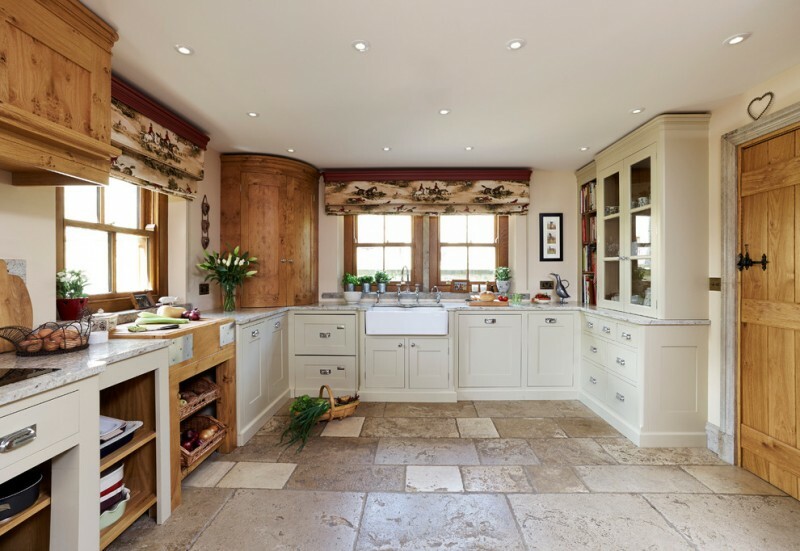 Together with lots of wood used in the kitchen, a stair, pillars, and various other things in the room, this floor manages to give the kitchen a nice traditional look to it. 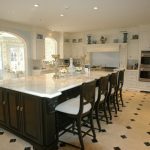 Travertine is something nice to have since its color doesn’t stand out too much but it’s got a simple yet elegant look and the travertine floor below is a very nice proof of that. 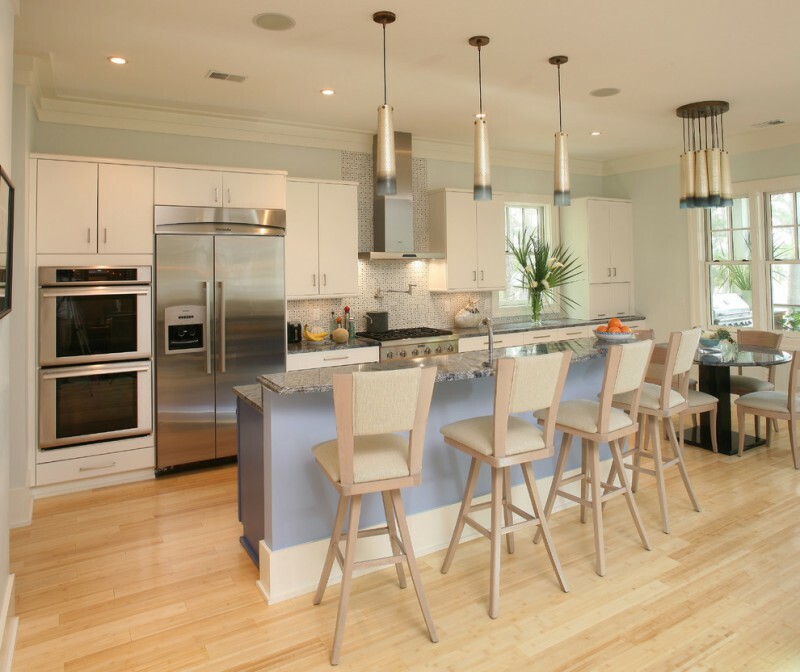 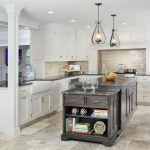 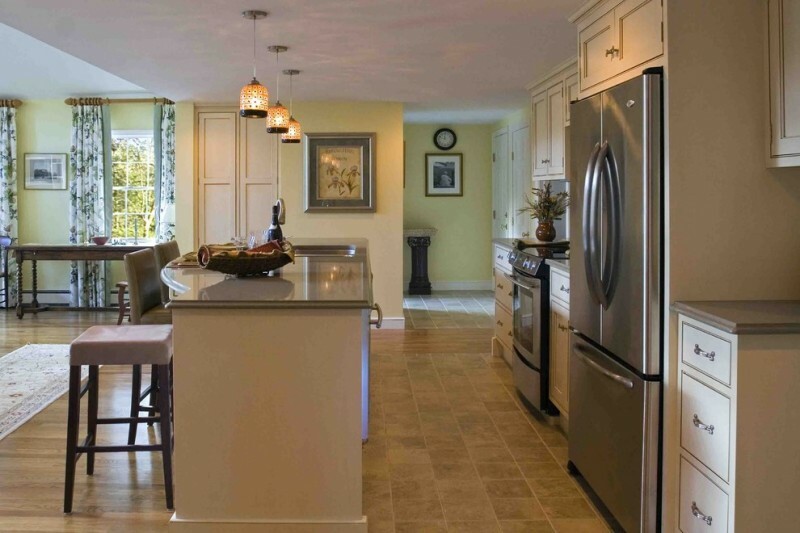 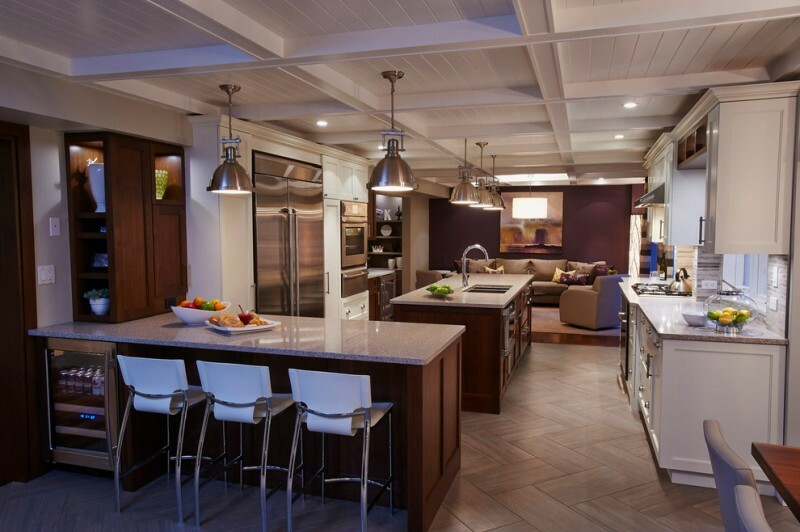 The designer of this kitchen sure made an excellent job when deciding on this hardwood floor as it, along with paneled appliances, light wood cabinets, and other things in the kitchen, really give the room an atmosphere that provides the homeowners with a lot of comfort. 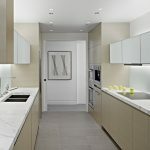 Having two different floors in a room like this should give your room an eye-catching look and all the more so if you have things that complement the floors well like white cabinets, a lovely sofa, and a window that brings in a lot of brightness in, among others. 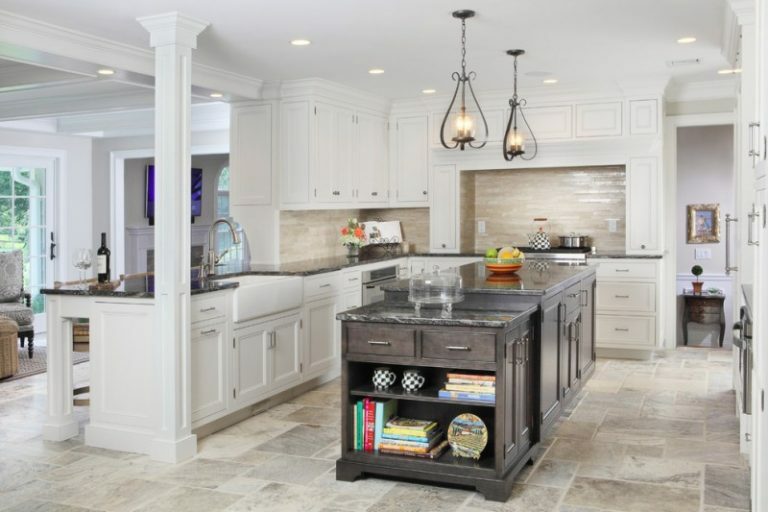 Limestone is an amazing material and when used the right way and combined with awesome things like wooden cabinets, high quality appliances, and simple yet interesting decorations like the ones in this room, it can turn a room into one anyone would love to cook foods in. 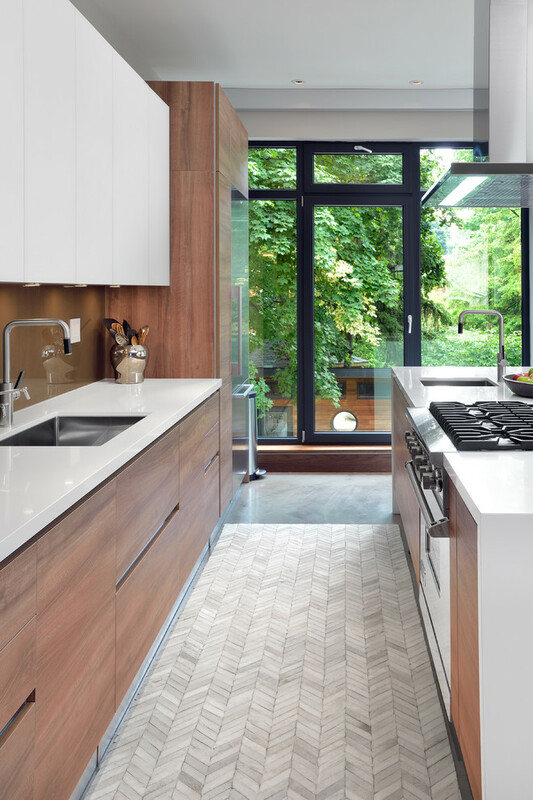 Floor tiles with chevron-like patterns like these will add a nice look to a kitchen and they work surprisingly well in kitchens with various designs. 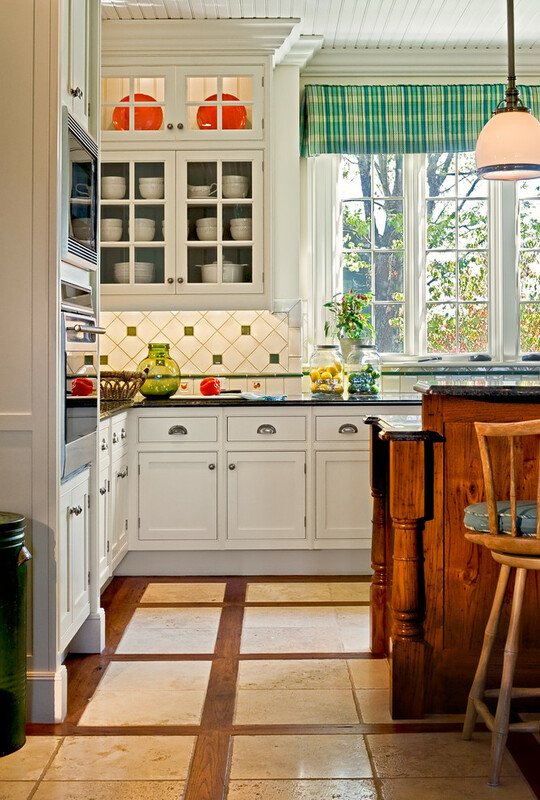 Here, they’re combined with wood color, glass, a white countertop, and more to give the kitchen a fresh look. 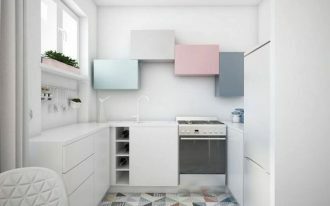 The unique floor below has wood frames and it has brightness-providing windows, lots of storage space, pops color, and a number of other things that makes the kitchen eye-catching despite actually being simple. 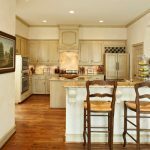 The travertine floor used in this kitchen that’s dominated by white sure complements the main color of the kitchen very well, improving the room’s overall looks. 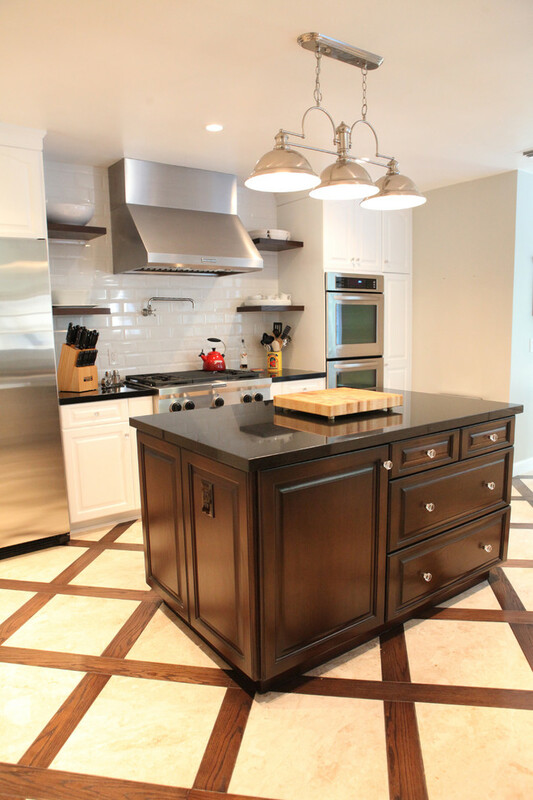 A floor with intertwining patterns like this one is surely an awesome thing to have. 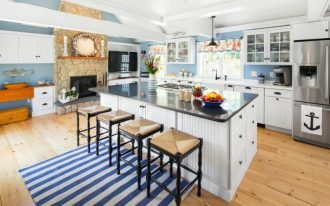 It helps that the dining chairs, sofas, hanging lamps, and other modern items in this kitchen don’t let the floor be the only awesome thing the only awesome thing in the room. 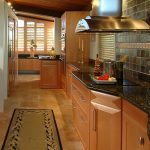 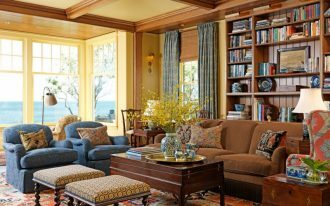 This floor is similar to the floor with wood frames earlier but on this one, virtually every wood frame crosses another to create a very eye-catching frame patterns. 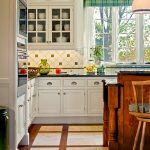 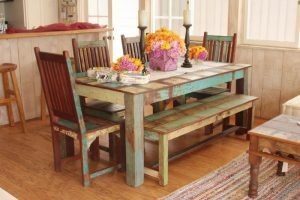 In a kitchen filled with things with traditional designs like a wooden corner cabinet, a wooden door, and more, this floor fits in very well with very little effort. 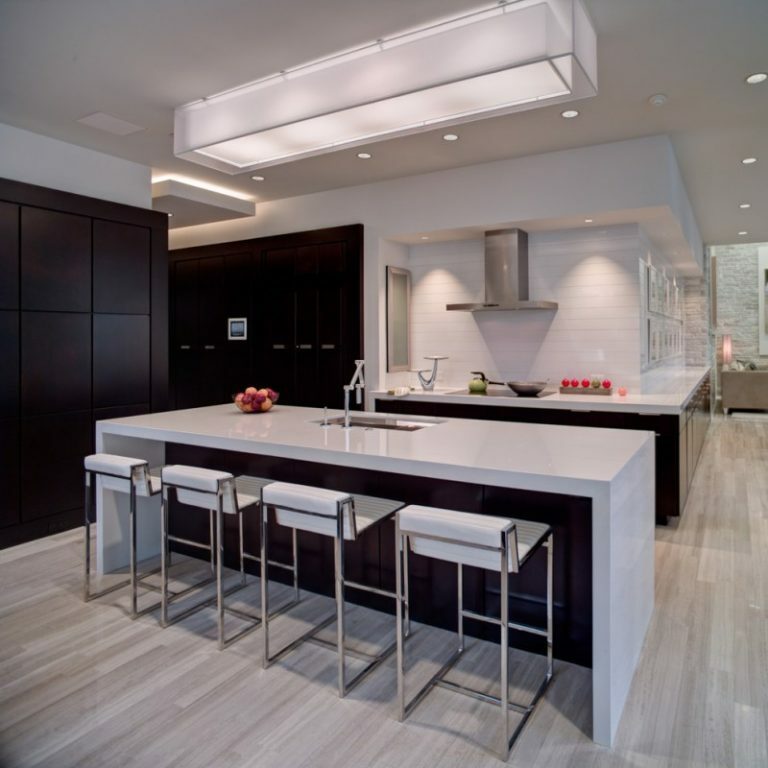 The kitchen below is filled with modern items like modern dining chairs, a modern ceiling lamp, and a floor that finds no problem in finding out that the room is actually where it belongs. 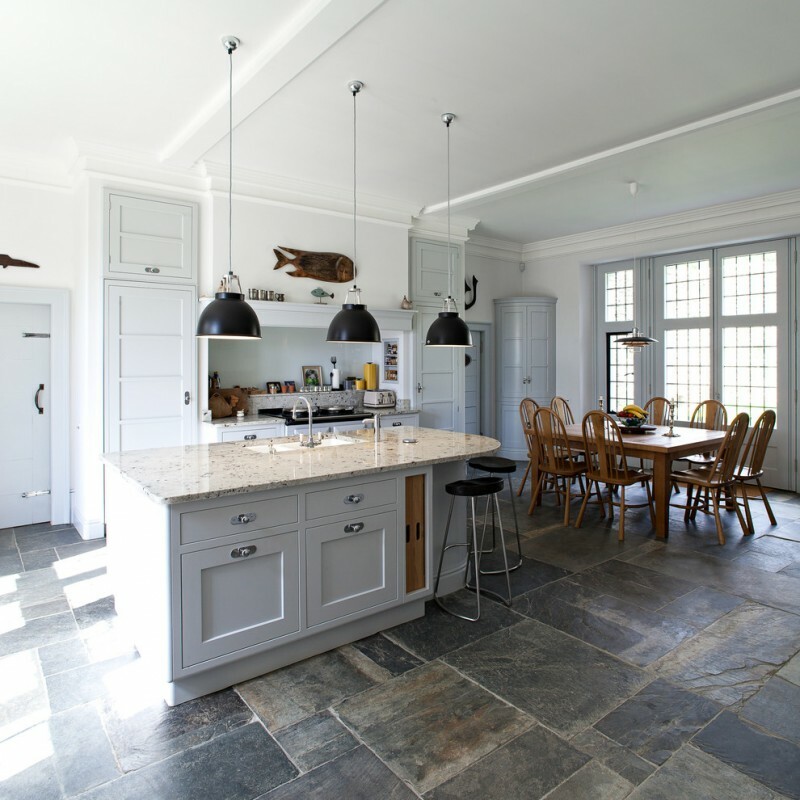 Having large tiles, this floor doesn’t have any form of inferiority complex at all since it doesn’t think that the kitchen is small and it’s very confident that it’d easily be able to give the kitchen the lovely look it requires and deserves.